With a novel modeling and mapping platform covering tens of thousands of species — everything from mammals and birds to plants, amphibians, reptiles, arthropod groups, and fish — the new app Map of Life presents localized species information via maps, photographs, and detailed information. The app endeavors to provide ‘best-possible’ species range information and species lists for any geographic area, instantly. Map of Life aims to support effective and global biodiversity education, monitoring, research and decision-making by assembling and integrating a wide range of knowledge about species distributions and their dynamics over time. Instead of sifting through hundreds of pages in a printed field guide, naturalists get a digital guide that is already tailored to their location. The Map of Life assembles and integrates different sources of data describing species distributions worldwide. These data include expert species range maps, species occurrence points, eco-regions, and protected areas from providers like IUCN, WWF, GBIF, and more. All data assets are stored, managed, backed up, and accessed using a hosted cloud instance. 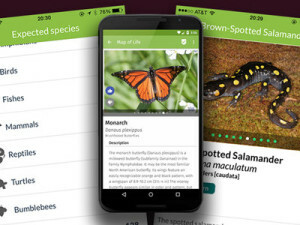 “The app puts a significant proportion of our global knowledge about biodiversity in the palm of your hand, and allows you to discover and connect with biodiversity in a place, wherever you are,” said Walter Jetz, a Yale University associate professor of ecology and evolutionary biology, and the guiding force behind Map of Life on Yale News.